You could argue, and some will, that the news delivered this afternoon in the media center at Quail Hollow by two of the biggest bosses in golf is good for the game. Here, straight from the mouths of Pete Bevacqua of the PGA of America and Jay Monahan of the PGA Tour, is your new and improved golf schedule: March, the Players at TPC Sawgrass; April, the Masters; May, the PGA Championship; June, the U.S. Open; July, the British Open; August, the FedEx Cup events; September, the Ryder Cup in even-numbered years and the Presidents Cup in the odd ones. You know — well, the whole world knows — what happens next, after some lucky soul hoists a FedEx check for $10 million, plus, plus. Hank Jr., heck, he's got a whole song about it: Are you ready for some football? Thursday, Friday, Saturday, Sunday, Monday night. You know what September through the Super Bowl is like in your house? Multiply that by 100 million. The PGA Tour marketing department, counting eyeballs and every platform you ever heard of and some you haven't, got tired of competing with that juggernaut a long time ago. This new schedule is good for the Players, back to March, when the wind is up and players and fans are eager for some meaningful golf. It's always good to go first — unless you're breaking bread with the wrong people — and now the PGA Tour's marquee event is back in the leadoff spot, on a course that is more interesting and alive in March than it ever was in May. It's good for the marketing people at FedEx, trying to get as much bang for their sponsorship money as possible. It's good for the British Open, now the last major of the year. When one of the R&A gents presents the new winner as the champion golfer of the year, there will be a certain finality to it. The claret jug becomes a fitting exclamation mark. Fewer August distractions for the (in all likelihood) three FedEx Cup series events. The Olympics, which over time could become the most meaningful event in all of golf — Olympic gold is worth a sum that cannot be calculated — is no longer a drag on the schedule for the game's bet players, or at least less of one. You can play the British Open in mid-July, take a long nap, then go play in the Olympics. The Masters is the Masters and the U.S. Open is the U.S. Open — no need to worry about those two events. The event you might worry about in this scenario is the PGA Championship, a great and grand tournament that had an overwhelming sense of identity in the Walter Hagen era and even in the Ben Hogan era but in more recent decades has looked sort of like a junior version of the U.S. Open. Will inserting the PGA Championship in the fast eight or nine weeks between the Masters and the U.S. Open serve the event well? Bevacqua sees that as a positive and maybe it is. He argues that a late May date will give the PGA of America a chance to bring the event to courses in Texas and the Carolinas and some other states that seldom see major championships. But the majors become the majors because of how the players feel about those four events deep in their guts. Everything, including TV ratings, flow from that. 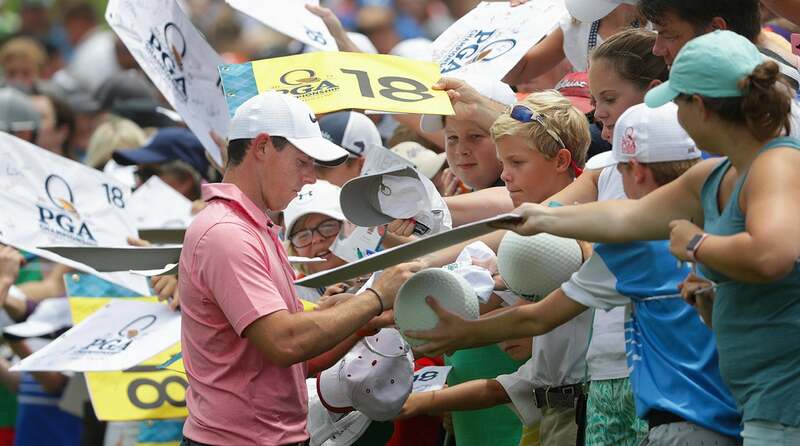 When the players live and die by what happens on the course — as you saw with Matt Kuchar and Jordan Spieth at Royal Birkdale — fan involvement gets intense. When the player's attitude is, Well, I got another one coming right up, something is lost. That's the difference between your every week PGA Tour golf and the four majors. What I love about the four majors is the incredible intensity that surrounds them. The players supply that. A marketing department can help. Superior TV coverage can help. But it starts with the players. The players responding to the course and its demands, the spoils, the history, the status a victory or even a high finish might promise. Viewed in the broadest way imaginable, there probably wasn't much in the way of choice for the PGA of America here. The PGA Tour is golf's 800-pound gorilla. The Tour pretty much sets the schedule, because it controls the players. The players control the Tour, yes, but the Tour over the years has become like a locomotive with the players following it wherever it goes. Only Augusta National can dictate to the Tour, just as it dictates to CBS. There will be other shoes to drop here, in the months and years to come. Will CBS keep the PGA Championship? Or will it go to NBC Sports, which had the Players when it was played in May? NBC lost the USGA deal but it is positioning itself to be the American network most committed to world golf. It already has the British Open, the Ryder Cup and golf at the Olympics. The PGA, as a May event and bringing players from all over the world together, would be a natural fit for the network. Maybe CBS would want the August FedEx events. This deal that sounds so simple and this new schedule that sounds so elegant was years in the making. There's a reason for that. Golf, and golf-on-TV, is big business, and everybody wants their hands in the till. Maybe that matters to you but more likely you're like Junior and millions of others, you're ready for some golf and if the golf is good, that's even better.